Soshite Ashita no Sekai yori (And Then, From the Future World) is a romantic drama dissecting some very complex interpersonal relationships. At first you might be put off by the fact that as the game starts all heroines are already fully acquainted and even attracted to the protagonist, giving the work a vacuous romantic comedy feel. However, it wouldn’t be Takehaya, the author of the superb Harukani Aogi Uruwashi no, if he didn’t overturn the tables completely, which he indeed does by introducing a meteorite about to destroy the earth in a few months time to his love story. The established stable and peaceful relationships start to crumble away with these news, with a dependent childhood friend suddenly becoming sickeningly clingy, a once dependable teacher crumbling under the pressure, a tomboyish girl struggling to hide her femininity transforming into a seducing vixen, and a girl with a terminal illness becoming bizarrely lively and energetic. Those seemingly simple relationships of friendship quickly devolve into ordeals of angst and frustration. Personally, I found the story about Aoba’s dichotomy the most intriguing for managing to be both creepy and intensely romantic at the same time. 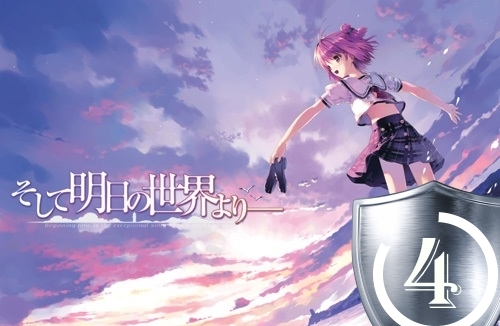 Though Takehaya also exhibits his talents at writing subtle frail heroines in Minami’s route, achieving emotional connection almost comparable to his “Kanishi”. On the other hand, Yuhi’s and Asahi’s routes come off as predictable and even somewhat misguided in Yuhi’s case. Though the two are fairly complex characters too, they really can’t hold a candle against Aoba and Minami. I was also significantly disappointed that none of the stories go to the very “end”, cutting off as soon as the complexities of the relationship itself are fully explored. Takehaya really wasted a lot of dramatic potential by not writing anything about the lovers facing actual horrors of the calamity instead of only contemplating about them. What definitely puts this work below “Kanishi”, however, is the protagonist, who while not exactly bad, is definitely no Takizawa Tsukasa, and is just your local kind and positively thinking adolescent. Music is also surprisingly bland, with most of the tracks being atmospheric cheery slice of life pieces and only a handful actually sounding any romantic or dramatic. Oh yeah, I almost forgot, the After Story which takes place in the “new world” is surprisingly well crafted and touching despite being almost irrelevant to the romantic interpersonal relationship study this work actually is. Anyway, Soshite Ashita no Sekai yori is definitely worth reading for anyone interested in good complex romance. The pace might feel slow at start, but, unlike most vns, every single piece of dialogue is actually relevant to the plot in here.